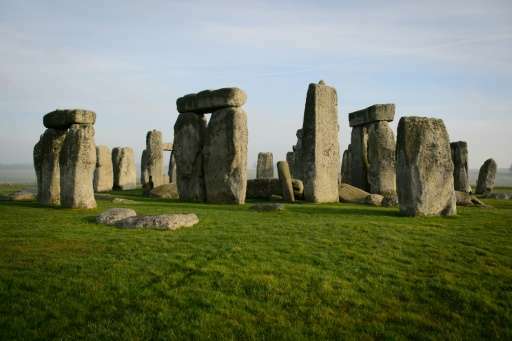 The buried remains of a mysterious giant prehistoric monument have been discovered close to Britain's famous Stonehenge heritage site, archaeologists said Monday. Up to 90 standing stones, some originally measuring 4.5 metres (15 feet) and dating back some 4,500 years, are believed to have been buried under a bank of earth and remained hidden for millenia. Archaeologists using multi-sensor technologies discovered the "C-shaped arena" at Durrington Walls—a so-called "superhenge" located less than three kilometres (1.8 miles) from Stonehenge, in southwestern England. "Durrington Walls is an immense monument and up till this point we thought it was merely a large bank and ditched enclosure, but underneath that massive monument is another monument," Vincent Gaffney told the BBC. The discovery was made by the Stonehenge Hidden Landscapes Project, an international collaboration between the University of Birmingham and the Vienna-based Ludwig Boltzmann Institute for Archaeological Prospection and Virtual Archaeology (LBI ArchPro). The newly discovered stones, which have yet to be excavated, are thought to have been toppled over, with the bank of the later Durrington Walls henge built over them. The neolithic henge, or monument, which is a part of the Stonehenge World Heritage Site, is one of the largest known henges, measuring 500 m in diameter and more than 1.5 km in circumference. Project initiator Wolfgang Neubauer described the latest discovery as a "very important and fantastic finding" and said the monument could originally have comprised up to 200 stones. 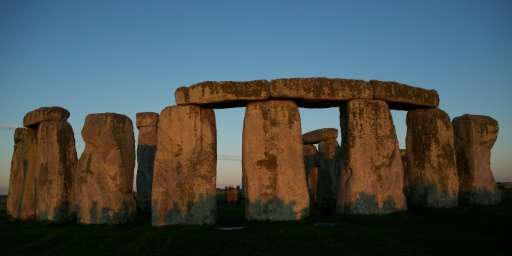 "The missing stones might be the stone material which was used later on to build Stonehenge," he explained, adding that those left in place were probably broken during attempts to move them. Although none of the stones have yet been excavated, archaeologists believe they may be locally sourced stones similar to a single standing stone, known as "The Cuckoo Stone", in an adjacent field. The earthwork enclosure at Durrington Walls was built about a century after Stonehenge, a ring of standing stones believed to have been erected between 3,000 and 2,000 BC. Archeologists say the new stone row could date back to the same period, or even earlier. "This discovery of a major new stone monument, which has been preserved to a remarkable extent, has significant implications for our understanding of Stonehenge and its landscape setting," said Gaffney. "Not only does this new evidence demonstrate a completely unexpected phase of monumental architecture at one of the greatest ceremonial sites in prehistoric Europe, the new stone row could well be contemporary with the famous Stonehenge sarsen circle or even earlier."